What do you use for trophies? This is the first year of our league. At each tournament, I gave the winner a black silicone bracelet (think Lance Armstrong bracelet) that had the four suits and ALL IN on it. For the championship next week, I have had a titanium bracelet made featuring our logo. I got it from IronDog Industries, and was $19 USD. These guys were an absolute pleasure to work with. Post your favorite trophy ideas and links! just got this for this year's champion. It's not cheap but definitely worth it, esp. since you can use it as a marker. It came in better looking than I expected; the picture does not do it justice. $45 shipped. I just took the money out of the 1st place prize for the Championship game. It's pure Silver, so it's not only a great trophy/card marker, but it is actually worth something. Cracking idea, I have ordered 25 sillicone ones and 1 metal 1.
brenner, freakin awesome man!!! i'm ordering one for my wife as POTY. One for "Top Money Winner" (Green), one for "Player of the Year" (Black), & one for "Mr. Consistency" (Red). Just as an extra little something for the win to brag with, plus we have extra cash since we don't need to re-buy the TOC trophy. The players loved the trophies and it seemed like some were more interested in winning those than the money! One player who busted out of the TOC tried to buy his way back in just to win the trophy. He offered one of the players still in about half of the 1st place prize from his own wallet. He was half joking, but I think he really wanted to do it. If you're interested, the small trophies and the pins I got from http://www.trophies2go.com. The Big Cup I got from http://trophycentral.com. Both had excellent service and fast delivery times. sweet, thanks 007!!! pins should be great. Thanks for starting this thread! After going to customsiliconebracelets.com, I decided to order custom bracelets with Back Door Hold'em printed on them instead of All In I ordered 50 blue ones to hand out as a Christmas gift to all my players, and ordered 10 orange ones to be given to the people who make the final, year end table. Thought I would revive this topic, and include the trophies we had last year. This is more of a prize idea than a trophy idea. I gave the top 3 places the cash (of course) and a subscription to CardPlayer magazine. They really seemed to like that. I have also given out card guards and sets of chips. I am interested to see what others give out. I like the bracelet idea, but I think the silicone ones have faded away in popularity. Moose...How did your guys like the metal bracelet? Any ideas would help. I like the bracelet idea, but I think the silicone ones have faded away in popularity. Moose...How did your guys like the metal bracelet? Any ideas would help. I agree about the silicone bracelets, and he are not doing that this year. I won the first one and I like it a lot. Our winner last year also seemed happy with it. There are fancier bracelets but I do not think anyone is wearing a bracelet on a regular basis and would rather put the extra money into the prize pool. However, the card guards get used often so I do not mind spending the extra money on those. I was originally thinking of doing a custom trophy for our league, but I couldn't really justify the expense, especially when the money would be coming out of the league pot. So, after much thought, I decided to go with these plaques. I did the design on Photoshop (it's basically a rip-off of the award that's given to WPT winners), and then just mounted them to a document plaque. 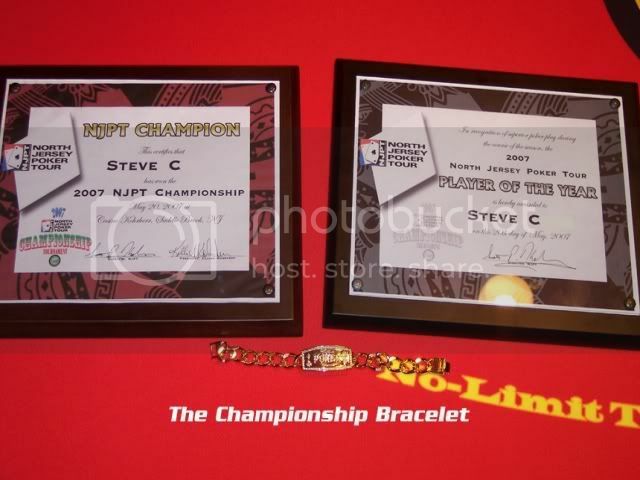 Of course, we also give out the championship bracelet, courtesy of www.pokerbling.com . I've been using the TD program for a couple years now. I can't believe that I've never been to this forum before today! I won a tournament online once (it's actually a weekly series of sorts), and on top of the prize money I also got this bracelet..
i went to www.trophypartner.com and got a 8" resin plaque for player of the year and a larger plaque (12" x 9"?) for our main event. I also use www.dyetub.com for certificates for each event winner. It's simple and easy to use, and everyone loves them. I attached a picture, I am at work right now so it is not the best picture of them but you can kind of get an idea. Plus, my poker room is still under construction.